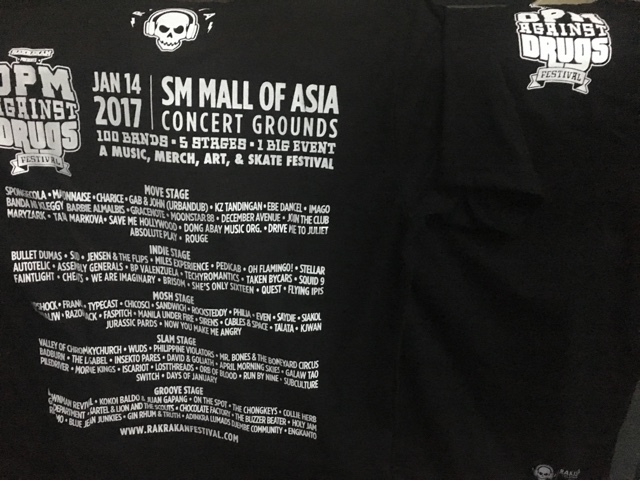 I had a blast at the Rakrakan Festival 2017, OPM Against Drugs, 100 Bands 5 Stages event. It's been about two weeks since the show but I still haven't gotten over the hype. Well, it takes me a while to write posts like this anyway (busy much :). To start with, below are some free items which came with the ticket. T-shirt sizes XL and M with back and front design (above). Slapshock calendars, PULP magazines, stickers from Rakista Radio and Red Horse, and discount cards from Victoria Court (O_o) and Dickies. 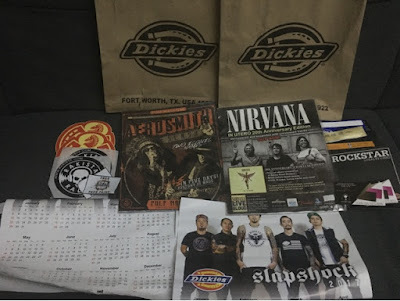 I didn't notice the stubs for free Marlboro sticks and free Red Horse stapled at the Dickies paper bags. At Php 1,590 (pre-sale), the tickets are definitely a steal because of the freebies and of course, numerous bands you can watch. Watch all these separately and you'd probably spend 100x more. After all, it's 100 Bands in 5 Stages. There's a video slideshow in YouTube of the photos combined as well. Here's a panoramic picture of people who attended. This was around 6PM (it got dark early) when most of the 5 stages were on break for dinner. These are some of the videos I was able to record. I missed some bands since the schedules inter-lap between five different stages. Most of the videos here were from the Mosh and Move stage. Late to the party (or at least the first act I intended to watch) because parking spaces within the area are full so we waited for a slot to free up before walking about half a mile to the venue. So the first track I was able to hear was midway done. Some folks were throwing slippers up in the air. Chicosci frontman Miggy Chavez was quick to make them stop while guitarist, Mong Alcaraz played a pun by strumming the intro to "Tsinelas" by Kamikazee. Mong stayed around when Sandwich played right after. This was one of the band's earlier tracks when they were first called Chico Science. Some of the younger fans aren't too familiar with the song. Miggy also belted out a track with Raimund Marasigan during the next act's (Sandwich) performance. Bassist Myrene Academia was probably present earlier during the day for Imago, which was scheduled in the afternoon. The show started at around 2PM and ended by 2AM the following day, making it a 12-hour program. An anthem of the older generation when Betamax tapes existed before VHS and movie streaming. Yep. I just had to include this photo of Raimund Marasigan and Miggy's bro hug. Sandwich probably played the fewest number of tracks compared with other bands. Maysh Baay's vocals makes us forget how the band used to have a different vocalist when they first recorded tracks which later on became love story themes. Talata's guitarist was a guest performer. Buddy Zabala (of the Eraserheads fab four) was on the bass guitar as well. Other than Sulat, this is possibly the most popular MoonStar88 song. This is my favorite act throughout the entire event. While I don't have as much videos taken, I enjoyed just staring at Saydie's vocalist (Kat Taylor) with jaws dropping every time she growls. Atta girl! The band's early (and lingering) fan favorite to this day. I planned to stay on the other stage but I felt dizzy with tinnitus right after Sandwich so I went for a break and dinner. It turned out to be a perforated ear drum. What a shock! But it's fine. It's quite manageable and will heal on its own in time (hopefully). I consulted an Eye Earns Nost and Throat (EEENT) specialist. It's my fault anyway. I stood at the same spot which everyone avoided because I thought I'd be closer to the stage. They were avoiding that space for a reason. It's right in front of a mega speaker with only about a feet or so away. So after the break, the closest stage was incidentally where Spongecola performed. Before they hit the stage, I saw them by the backstage lounge area. But I'm not one who approaches people for pictures; not even celebrities. Yael Yuzon's wife, Karylle was also there. She looks even prettier in person. Spongecola was shooting a video so they asked for audience participation. Vocalist Yael, even got assisted towards the other half of the area so he can get closer to the audience past the VIP section. He asked for permission from people infront, and everyone agreed. Quite possibly the most popular Sponge Cola track. Monty Macalino, was very entertaining all throughout their time on stage. One of their earlier hits. I missed recording some tracks including "Tayo na lang Dalawa." I enjoyed the band's fun (almost hilarious) mashup of some songs. This is a cover of The Teeth's hit song during the mid-90s. It was incidentally Monty's birthday on the same day as the event by the way. He was surprised with a cake. The track is extended due to some added interlude featuring a mashup of various foreign tracks midway through the song. It's been 20 years of Slapshock! The band was most likely shooting a video of some sort. It took about 30 minutes for the staff to prepare audio equipment to make them sound perfect I guess. This is one of the band's earlier hit songs. Drones (with camera most likely) flew overhead for aerial shots. Jamir Garcia, the band's front man urged to part a sea of people (ala-Moses). Some members of their official fans club also participated. It was crazy with all the head bangin'. You'd actually feel the brick-tiled floor shake. But there was no stampede, luckily. But this was the act with the most number of videos I was able to record and possibly with the most attendees. You can't even walk past people to move towards the adjacent stages. They were the band with the most number of songs played too. I got a short clip of this band's performance too. Looks like the group is releasing a new album soon. Other bands I was able to get a glimpse of or at least hear from afar include Grin Department and Siakol. There were other acts I wanted to watch but schedules overlap between stages. I had no clear photo of the band. The lighting was dimmed (err.. almost like turned off) all throughout their performance. But that's alright. Just close your eyes for the music! The band's most recognized hit song. Last act for the night, on one stage that is. Dong Abay even posted on social media how all other bands before him were his front acts. The former Yano frontman made an entrance dancing like a tribal member of some sort before singing. Abay, also talked about how some of his friends were no more due to drug abuse. Incidentally the hash tag for the event - #OPMAgainstDrugs. Dong attests to have stopped talking drugs a long time ago. This is my favorite song from Dong Abay. The lyrics can become the anthem of anyone who is affected by their imperfection. Another epic hit when Abay used to lead Yano. I placed all videos in a playlist for easier access.